We have recently purchased a tracked dumper to help us complete work on difficult or sensitive sites with minimal disturbance. Over the recent years we have been finding accessing land more difficult due to the extreme wet weather that is becoming more frequent. The tracked dumper enables us to access areas to work that most other people can’t and also offers the benefit of extracting materials from those areas. We have found it very useful on wetland sites as machines on wheels would not have been able to gain access. 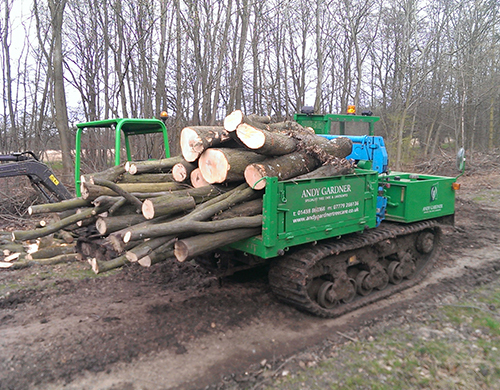 The dumper has a payload of 2.5 tonnes and can be loaded with any material that requires moving, eg soil, rock, timber or plant. A custom chip box has been made that is removable which gives us the flexibility to use it as a tree truck. The machine can either tow a chipper onto site, or if the conditions are really bad, it can simply lift it on the back with its fitted crane. This means we can take chippers to any location that the dumper can reach. The machine is also fitted with large chassis hooks front and rear so it is able to drag or pull material out of lakes, rivers or wet areas. 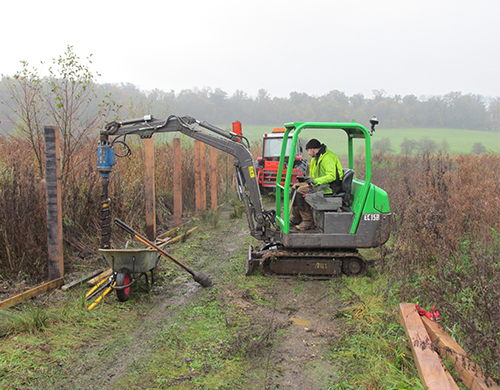 The large tracks are designed to have very little ground impact so it is ideal on river banks, building sites, wildlife sites (especially SSSIs) and wetland areas. We have also completed our CPCS certificates so are fully qualified to work on building sites. The machine can be hired as part of a team to carry out a task or just with an operator.